Learn a fabulous and unique method to make a REALISTIC looking straw bonnet. This bonnet uses materials that are IN SCALE!! Not like those thick stiff straw bonnets you have been settling for up till now. 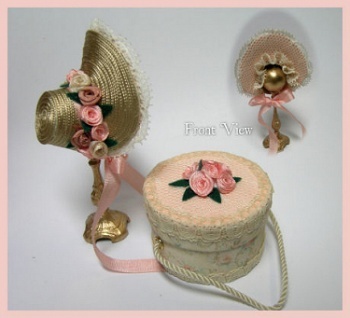 This one is lined in pretty peach silk and has a matching hatbox.